Size: 2.5" x 4.0" x 0.4"
Texas Instruments introduced in 1988 this powerful Phone Bank. The memory capacity of 2.85 kByte RAM holds as much as 150 names and the associated phone number, anniversary date or similar. 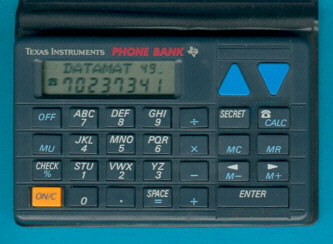 In the calculator mode the TI-2400 Phone Bank provides the four basic functions and a memory. Main disadvantage of the TI-2400 is the small display. The internal construction of the TI-2400 is typical for the whole line of TI organizers. A 8-bit microcomputer system based on a Toshiba microcontroller surrounded by 8k Byte RAM. A similar construction was later used with the TI-2100 Pocket Info. The TI-3100 Pocket Dialer combined the Databank feature with a small loudspeaker to generate the multifrequency dial tones. The TI-2400 Phone Bank is featured in the Texas Instruments Incorporated leaflet Pocket Solutions (CL-1059) dated 1990.